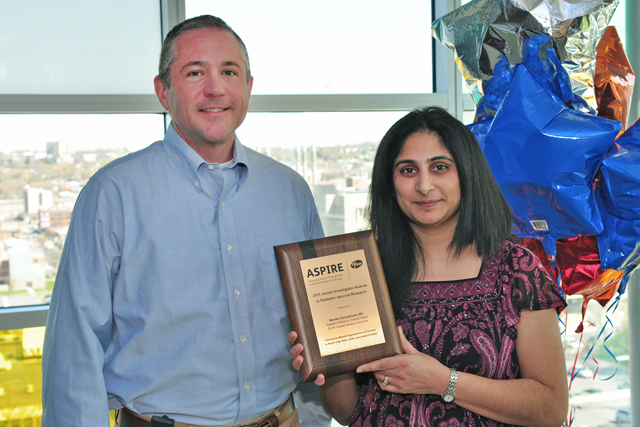 Joseph Domachowske, MD, a pediatric infectious disease specialist at Upstate Golisano Children's Hospital, and Manika Suryadevara, MD, an infectious disease fellow at Upstate, received the ASPIRE Award in Pediatric Vaccine Research in recognition of their work to provide free flu shots and pneumonia vaccinations at the Salvation Army's Christmas Bureau distribution held last December. In addition to vaccinating 460 people, from ages six months to 94, Upstate enrolled 1,533 children who will be studied over the next year by researchers for a study assessing new paths to reducing barriers to childhood immunizations. 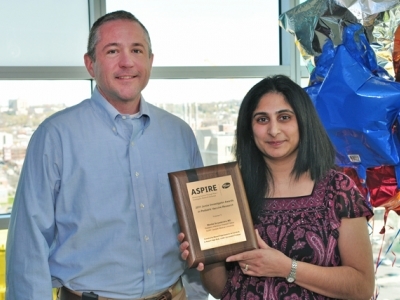 The award and the research were sponsored by Pfizer. 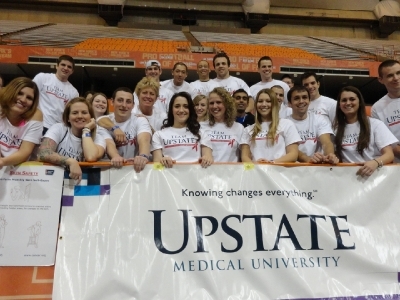 Students from the College of Health Profession's Radiation Therapy Classes of 2012 and 2013, part of the Upstate Medical University Chapter of the Colleges Against Cancer, participate in the 2012 Syracuse University American Cancer Society Relay for Life at the Carrier Dome April 14. 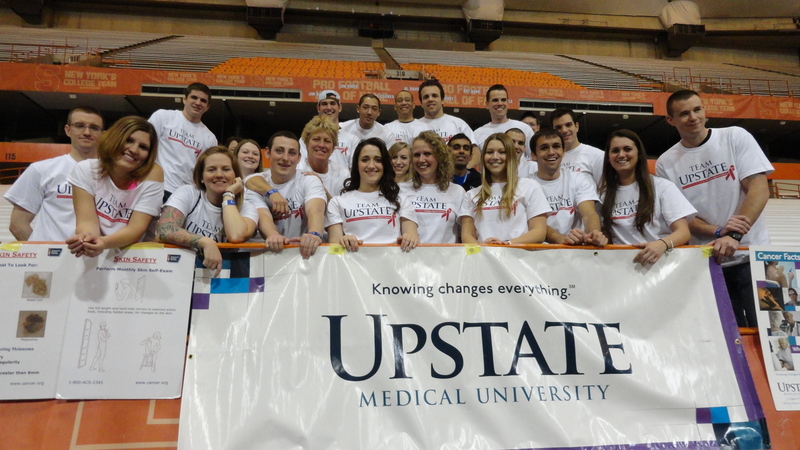 Upstate's chapter, co-chaired by radiation therapy students Daniel Zachary and Joseph Pagano, helped raise more than $148,000 for various American Cancer Society patient programs. As part of the event, radiation therapy student Renee Gardner led two Zumba sessions. 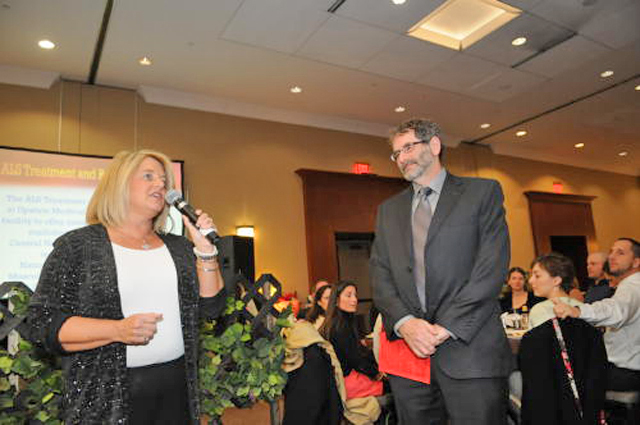 Mary Lou Watson and Jeremy Shefner, MD, PhD, of Upstate’s Department of Neurology, offer remarks at the 14th annual Mystery Malt and Merlot March 30. 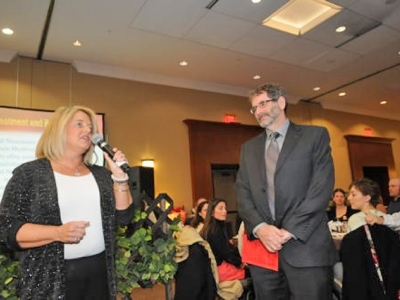 More than 300 people attended the event, raising nearly $37,000 to benefit the Neurology Department’s Amyotrophic Lateral Sclerosis (ALS) Treatment and Research Center. The event was sponsored by Advocates for Upstate Medical University.